So the big joke it seems is that Sully and Mike were rivals, but I bet they learn the magic of friendship at the end of the movie. It's really interesting that we get to see more of this world. I think that the world building of MONSTERS, INC. was one of the stronger suits. One of the things that I hope doesn't happen is that we will see how all of these monsters that we came to knowing the first movie were somehow all connected or affected each other's lives. I'm mostly thinking that due to Steve Buscemi being back as Randall. Anyway, I am interested to hear what other people think about the trailer. Let me know what you think in the comments. 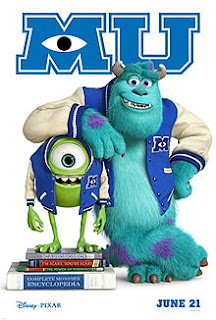 MONSTERS UNIVERSITY comes out on June 21st, 2013, directed by Dan Scanlon, and stars the voices of John Goodman, Billy Crystal, Steve Buscemi, and David Spade. Monsters Inc is my absolute favorite Pixar movie, and this makes me very nervous. First of all, No Boo (Sad). Second of all, obviously Mike doesn't become a scarer. Important sure there is going to be a very "poignant" scene about that which will no doubt annoy and sadden me. Also, Monsters Incs grown up monsters worried about their responsibilities,trying to save their energy source while dealing with an unknown threat in the form of a toddler is an interesting funny story. The college rival/buddy movie is old hat. :-/ Don't screw this up, Pixar. Charlotte, I'm completely with you on this. The rivals that become friends thing has been done over and over. One of the things I didn't mention was how I was a little worried about the fact that monster society seemed to be so focused on scares and scaring. It almost makes me question how that will change our outlook on the original movie.